March Course: February 25th and March 4th, 13th, 18th and 25th - all at 18:30 to 21:00 - - Fully Booked. April Course: March 11th, April 1st, 8th, 29th and May 6th - all at 18:30 to 21:00 - Fully Booked. May Course: April 30th, May 7th, 21st and 28th, June 4th - all at 18:30 to 21:00- Only ONE Place Remaining. For private courses, please contact me regarding dates. What is HypnoBirthing™ The Mongan Method? HypnoBirthing helps women give birth in a safer, calmer, more comfortable way. HypnoBirthing is not just a set of techniques, but a philosophy supported by techniques. Even when using HypnoBirthing, there is not one particular ‘right’ way to give birth. Mothers are presented with a range of tools and techniques, which they can practice at home, discovering which work best for them. Many people hear the word HypnoBirthing and think it sounds scary or strange, or worry that HypnoBirthing means they will lose control and/or not feel they are present, or aware, at their baby's birth. Rest assured, HypnoBirthing isn't just for hippies! Most importantly, you'll learn how to put yourself back in control of your birth - rather than blindly turning your birthing experience over to your doctor or midwife. HypnoBirthing doesn't mean you'll be in a trance or a sleep. Rather, you'll be able to chat, and be in good spirits - totally relaxed, but fully in control. You'll always be aware of what is happening to you, and around you. HypnoBirthing doesn't require any particular belief system, or prior experience. Some of our mums (and especially their husbands!) have been very sceptical at first - until they experience it for themselves. Just imagine welcoming each surge! Feeling peaceful... relaxing... and even smiling as your baby comes closer to you! HypnoBirthing is for anyone who would like to give their baby the best possible start in life. Whether it’s your first baby, or whether you’ve given birth before, everyone can benefit from HypnoBirthing. Mums will need to choose a birthing partner to work closely with. This can be the baby’s father, a friend, a relative or a doula, but it’s important that it’s someone the mum feels completely comfortable with. Bringing a baby into the world is possibly one of the most important and most exciting events of our lives. Yet it can also be one of the most daunting, with no chance at a practice run. HypnoBirthing helps you to prepare your body and mind for the challenge, so that whatever happens during your birthing, you can look back and feel confident that you were fully prepared. As you practice the HypnoBirthing techniques during pregnancy, you are not only preparing and readying your body and mind for birth, but you are also getting the most out of your pregnancy by optimising relaxation, sleep and comfort for you and your baby. After a more gentle birth, both mum and baby generally recover more quickly, helping the whole family adapt to the new situation more quickly and easily. If, however, new parents feel overwhelmed or under pressure at all, they can use many of the techniques learned in HypnoBirthing even after baby’s arrival. What’s more, many parents find that babies born using HypnoBirthing are often calmer and more content than babies whose entry into the world was more traumatic or distressing. For me personally, HypnoBirthing gave me the confidence and strength to birth both my daughters naturally, without the need for medical intervention, and in a calm and peaceful way. Read my birthing stories here or see www.hypnobirthing.com for more inspiring stories. Together we can make the world a better place, by giving babies the best chance of a good start! 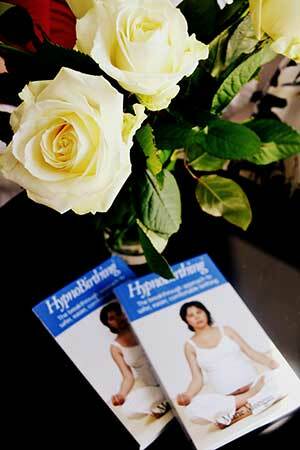 Read about even more benefits of HypnoBirthing here at the UK website. HypnoBirthing is a comprehensive birth preparation course. You and your birthing partner will study the physical process of birthing, as well as the effects of the body-mind connection. If appropriate, we will work on fear-releasing using light hypnosis, and we will also talk about what you can do should special circumstances arise. We will practice birthing positions and postures, and discuss eating for pregnancy, birth and breastfeeding, hospital births and home births, and prepare a birth plan. You will get ready for your baby’s birth mentally and physically by learning breathing techniques, massage techniques and relaxation techniques so that he or she can have the best possible start in life! For a full course overview please see the US HypnoBirthing website. I teach HypnoBirthing to individual couples (mum and birthing partner) or to groups of maximum four couples. In this way, I can give each family the attention they need and deserve. The optimal time to start is when you are between 25 and 33 weeks pregnant. Starting anytime after your 20 weeks scan ensures you have plenty of time to practice and make the most of the techniques before your baby's birth. It is never too late to start either - many mums have attended a class at 36 weeks plus, and have still had positive birth experiences as a result. Courses consist of 5 lessons of 2 ½ hours each, usually spaced one or two weeks apart. All materials (including a book, CD or MP3, and handouts) and refreshments are provided, and the price also includes email and telephone support. For current prices see here and please contact me to discuss possible dates. Some therapists/websites are advertising “hypnobirthing”, “hypno-birthing”, “hypnobirth”, “Hypno Birthing”, or just “hypnosis for childbirth” or even "HypnoBirthing". The HypnoBirthing Institute is the originator of the term HypnoBirthing™ and its founder, Marie Mongan is the creator of the original HypnoBirthing™ (the Mongan Method). As the foremost authority in the field, the Institute has provided detailed and credible instruction over more than 24 years to many thousands of women around the world, helping them and their babies to have a calm, easier, safer and more comfortable birth. The course is fully supported by the Royal College of Midwives in the UK. I am a fully qualified to teach the HypnoBirthing™ programme, and I am a registered member and affiliate of the HypnoBirthing® Institute. My courses, teaching methods and ongoing professional development are continually monitored and fully comply with the Code of Ethics and rigorous quality assurance standards of the Institute. Take a look at my page on Hypnotherapy for more information about hypnosis and self hypnosis. Change your expectations of birth! "Birth is a natural, normal and healthy human experience. Women's bodies are created to conceive, nurture the development of babies, and to birth." From Marie Mongan's book HypnoBirthing. Did you know that you can help control the symptoms of MORNING SICKNESS with hypnotherapy? Is your baby still in the BREECH POSITION? A study presented by Lewis E. Mehl-Madrona, M.D., Ph.D. in 1994, showed that from 100 babies, 81 were turned with the help of hypnotherapy as opposed to only 26 from 100 whose mother's did not receive hypnotherapy. Hypnotherapy can also help avoid INDUCTION by helping to start birth naturally. Here, in Denmark ONE IN EVERY FOUR births are induced. Induction can interfere with the natural course of labour, and put a mother's body under strain as it tries to keep up. This can sometimes result in more uncomfortable birthing and even further medical intervention. Get in touch to hear how Hypnotherapy can help. If you have taken a HypnoBirthing Mongan Method course in the past and would like a refresher course, please contact me for details. Thanks for yesterday, it was great! After our session, I felt so euphoric that my husband even said that it was a little creepy how much I was smiling lol. I feel good and have been feeling so much more loving and appreciative of my family. I am definitely more open and confident. The two hypnosis sessions that you and I did have really completely changed my perspective on things... Thanks Georgina, you've been amazing! Jeg kom til dig engang og er overrasket over hvad det har gjort ved mig. Jeg er blevet så lettet og alle de tanker jeg havde om hvad andre tænker osv. er næsten væk. Det er så skønt at have det så godt og mærke en forskel. Tusind tak for din hjælp, gode ord, teknik og i det hele taget, din hjælp og de hjemlige omgivelser du har, synes jeg var meget behageligt. Georgina made me feel very comfortable and not the least bit stupid. As a result of the hypnotherapy and TFT, I in my late 50's, no longer panic when I go under water and I can now swim underwater as well. This makes me feel much happier particularly when I am on holiday. I don't feel left out now when playing with the grandchildren in the pool or the sea. Thank you Georgina. It went just as I hoped Georgina. The balloon breathing was really effective - feel I got the most out of every surge. So happy it was possible to use hypnobirthing in my last birth. Thanks you Georgina, I felt great today after I left you, my face is so relaxed and I can feel a difference - looks like reiki is so miraculous and I really appreciate your help.